Knife sharpening shouldn't be a stressful ordeal; it should be a 10-second undertaking producing knives as sharp as those of any professional chef. It's not the money but the care you put into your knives that makes them sharp. 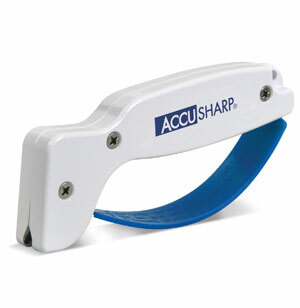 This ultimate knife sharpener features a unique ergonomic handle that is designed to fit either hand to help you provide adequate tools for all your kitchen needs. Just a couple of swipes and you'll have a fresh, labor-saving blade that will make your cutting chores easier! A great tool to have on hand. Perfect for cooks, crafters, and gardeners. Crafted from diamond-honed tungsten carbide. Easy to clean - just use soap and water. Reversible Blades for years of reliable use.